Re Reply 52 there is mention of Eddie Trudeau, suspect this a typo, name should be "Tredrea." 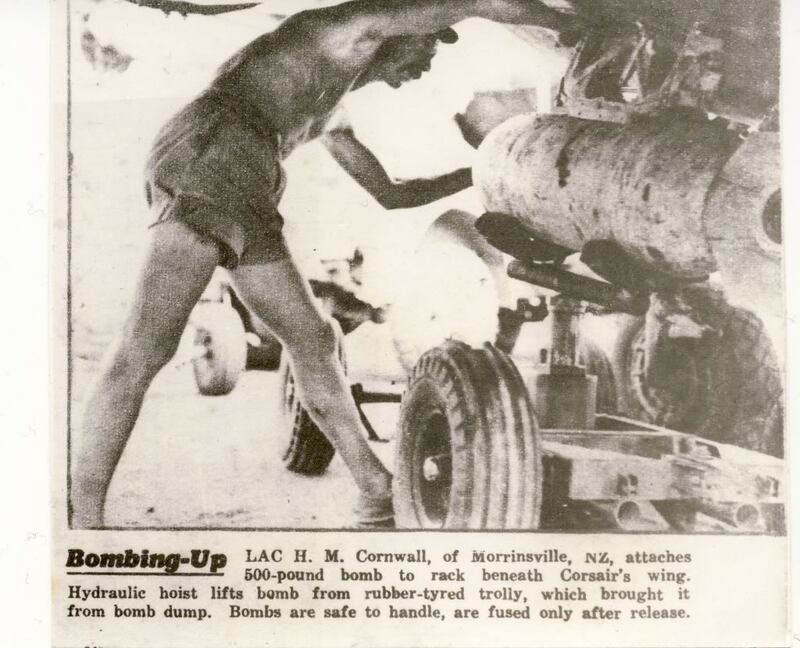 Prior to serving with TEAL Flt Lt NZ416557 Edgar Herbert Mervyn Tredrea served as a pilot with the RNZAF from 30 Nov 41 to 8 Aug 46. Thanks. Name correction carried out. Eddie is a Wednesday regular at Motat and is sharp as a tack , great to listen to. Yes a snapshot of a past era. Its sad sometimes looking at something like this knowing the people you are looking at are long gone but it sort of keeps them alive doesn't it plus its fascinating watching how they did things back in the day. One thing a little bit strange about that video featuring the Sandringhams. While they were supposedly overhauling the engines our of the Sandringham, I noticed all those gears that drive sleeve valves. 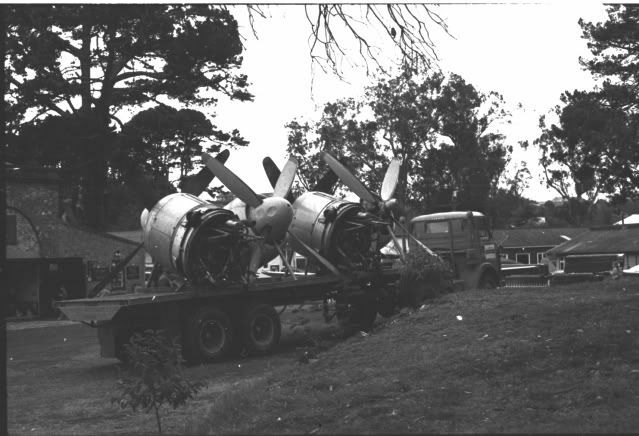 Now as Sandringhams were powered by Pratt & Whitney Twin Wasp engines which didn't have sleeve valves, I guess that means they mixed up footage of Bristol Hercules engines out of Solents being overhauled. 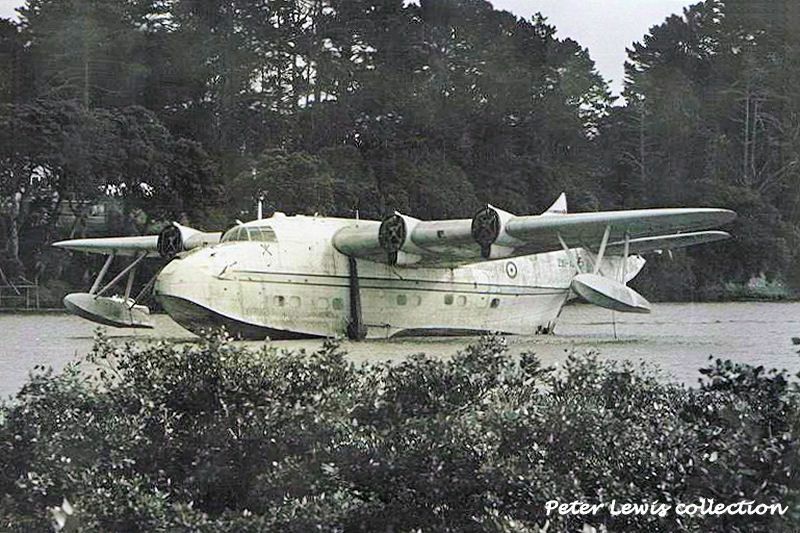 Must have been shot at around the time of the Sandringham/Solent changeover. 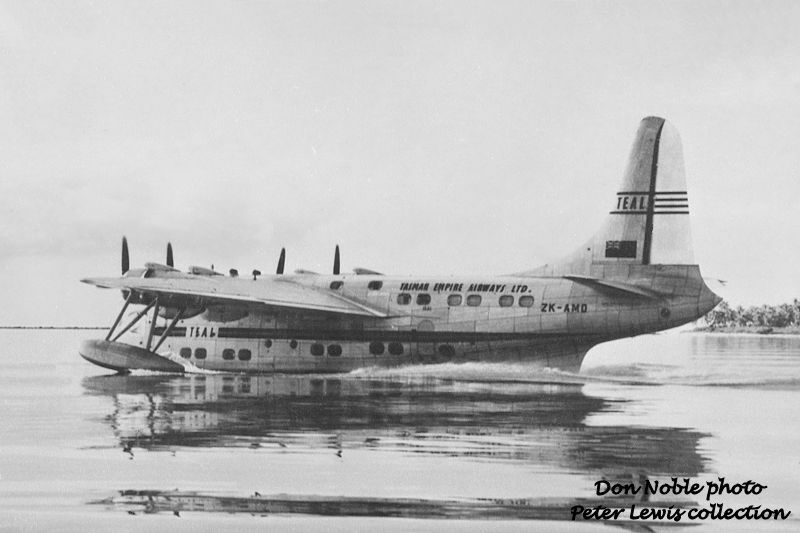 The third of the TEAL Solents, ZK-AMN c/n SH.1558, was built by Shorts at Belfast, and was named 'Awatere'. 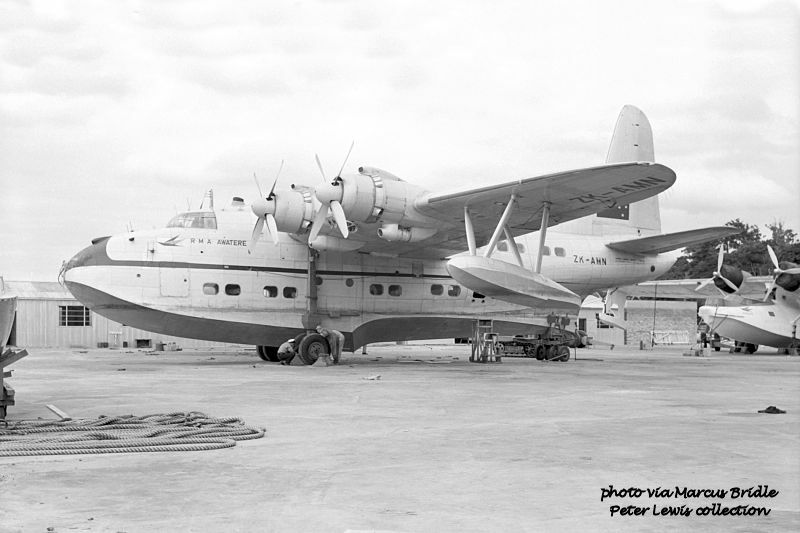 ZK-AMN was the second of the TEAL Solents to appear in New Zealand, arriving on 23Oct1949 and commencing work on the trans-Tasman service on 16Nov1949 commanded by Captain C. Griffiths. 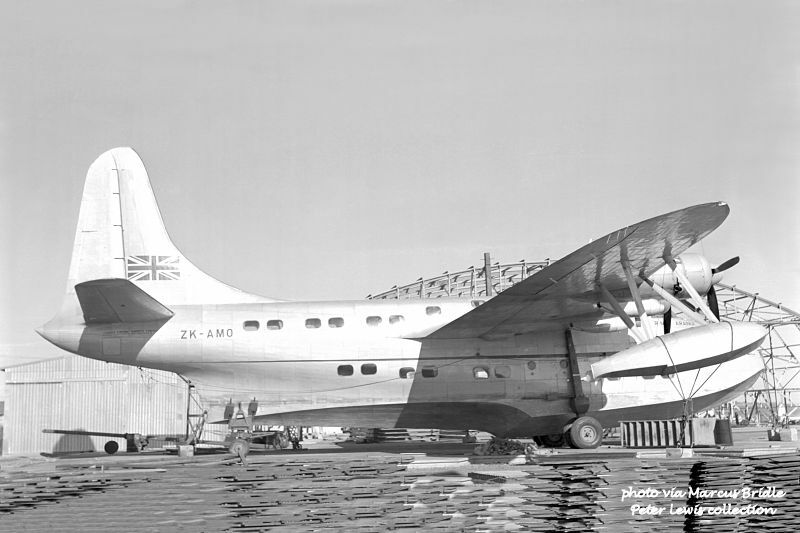 In common with the late Short boats, ZK-AMN arrived with the Union Jack painted on the fin. ZK-AMN at Mechanics Bay soon after delivery, apparently undergoing some engine replacement work. and while performing a low pass at an airshow. 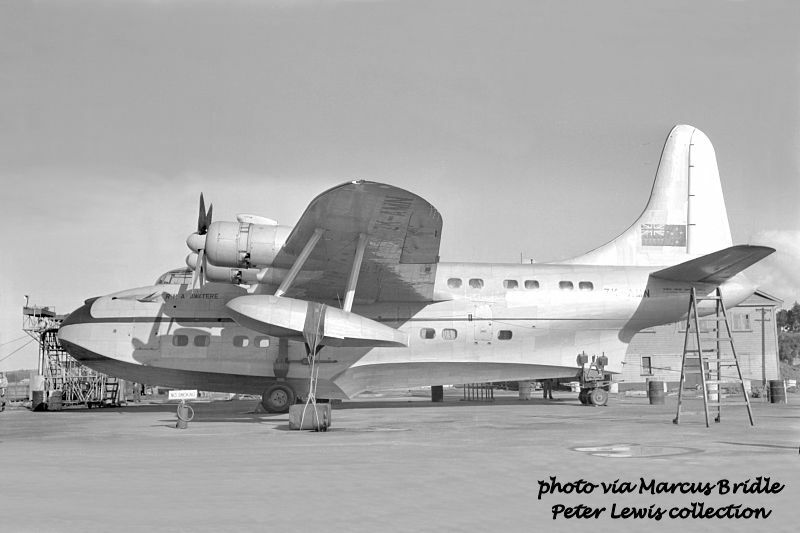 The Bristol Freighter is probably one of the SAFE aircraft. 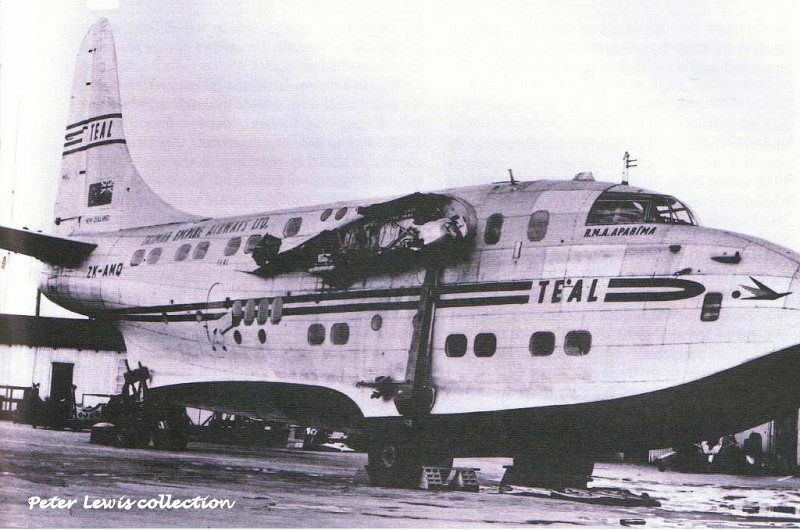 ZK-AMN appears to have led an unspectacular life while with TEAL, and was withdrawn from use in mid-1954 after the DC-6s arrived. 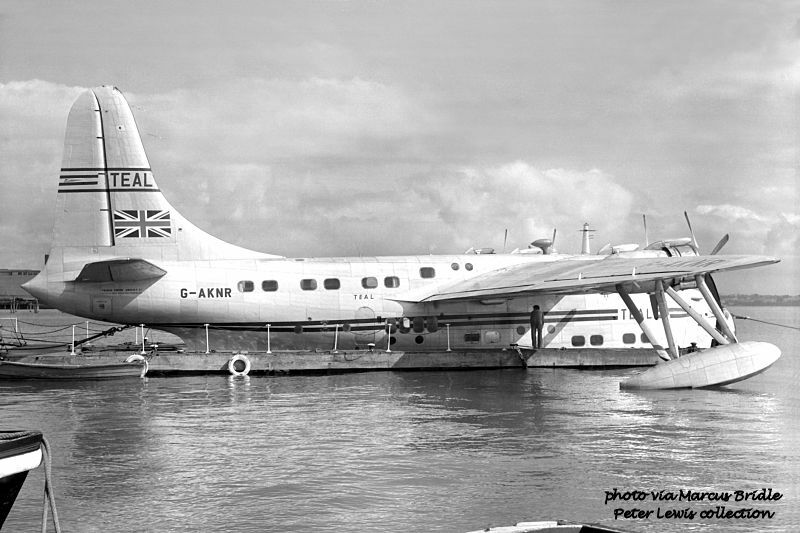 Along with ZK-AML it was sold to Aquila Airways Ltd., Hamble becoming G-ANYI 16Jan1955. 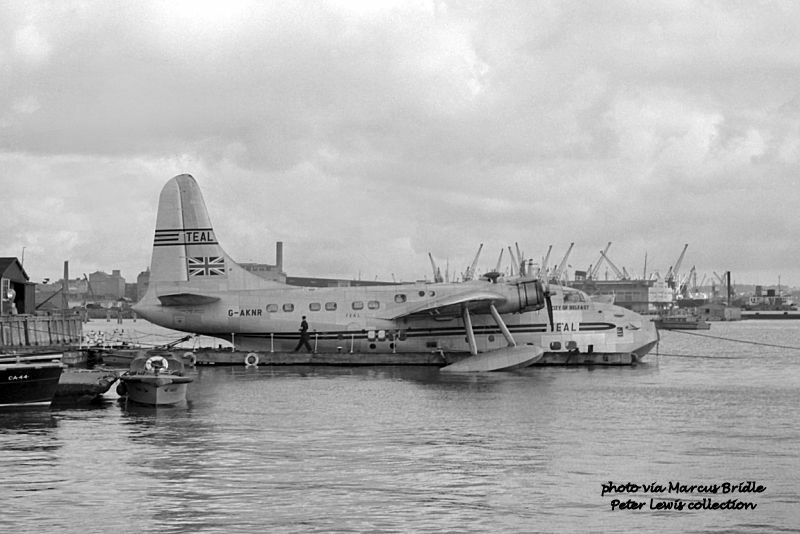 Ownership was transferred to Aerovia Aquilas Ltda in October 1958 but it was withdrawn from use at Lisbon after CofA expired 17Apr59. 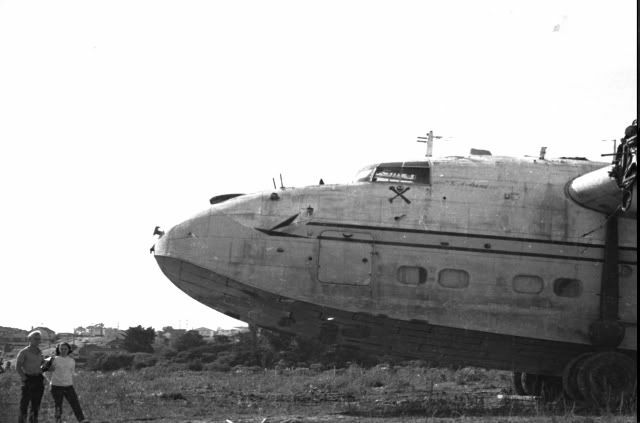 Left mouldering on the banks of the Tagus Estuary for years, it was finally scrapped in August 1971. Look at all those cranes in the background of the shot of it taxying into Mechanics Bay. Pre-container days, and not on strike. 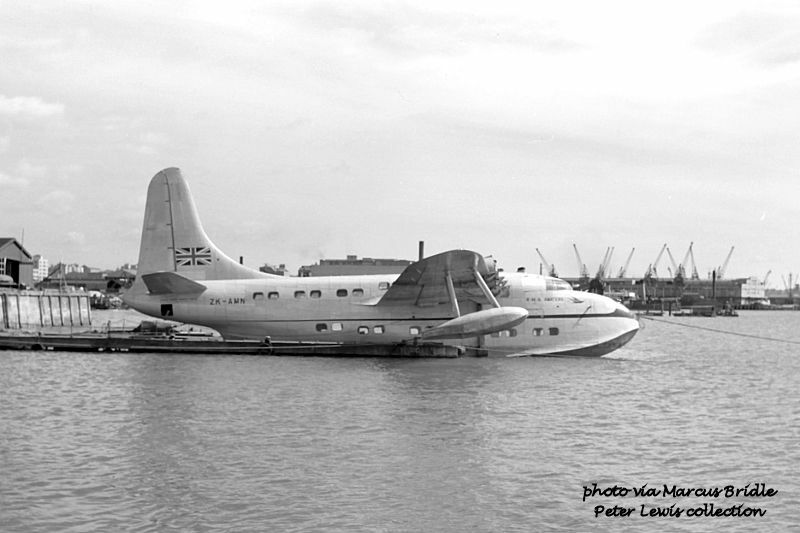 The last of the four Solent 4s ordered by TEAL was c/n SH.1559 which, after completion by Shorts at Belfast, became ZK-AMO in early November 1949 and was named 'Aranui'. 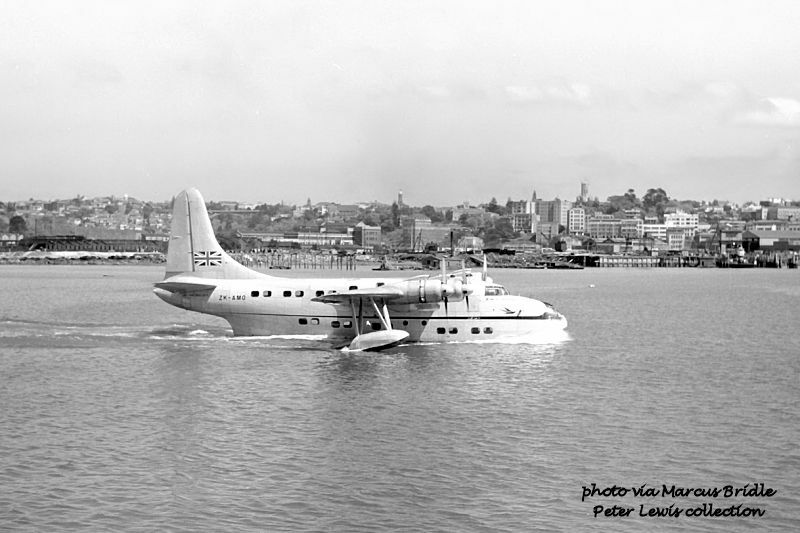 The aircraft arrived at Auckland on 30Nov1949, and carried out its first commercial Auckland-Sydney service on the 19th December commanded by Captain D.W. Keesing. Undergoing servicing on the hard at Mechanics Bay. 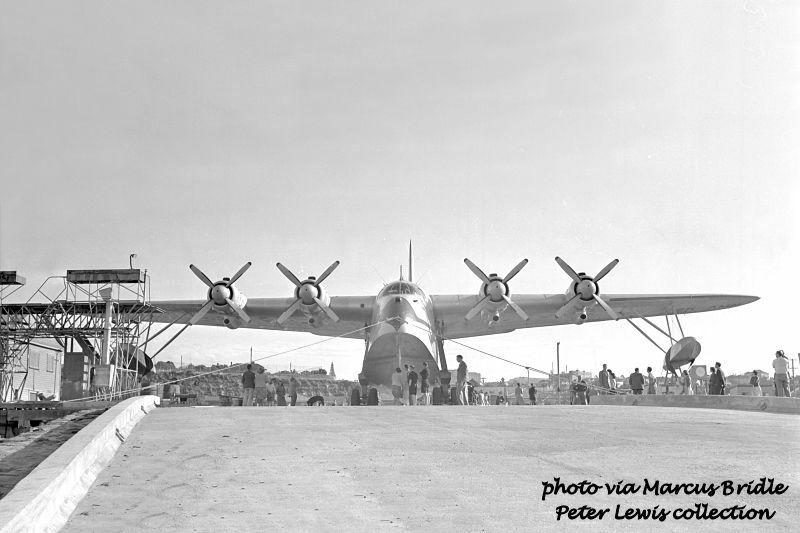 Note the TEAL hangar under construction at that time. 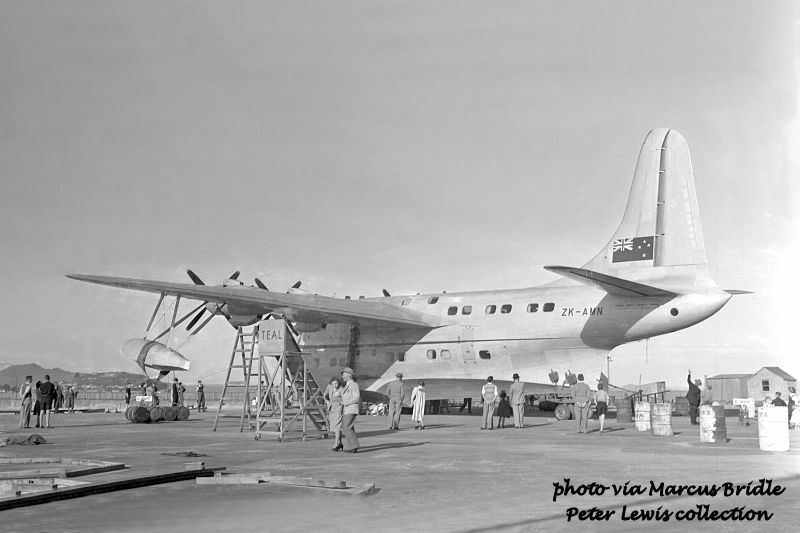 By 1951, NZNAC had extended its Sunderland III Pacific Service from Fiji to Aitutaki, Cook Islands at the same time as an Air Tahiti service linked French Polynesia with Nandi. These regional services connected with the BCPA Pacific route from Auckland to Vancouver. With the arrival of the Solents and the immenant withdrawal of the Sunderlands, these routes were to be handed over to TEAL and the service extended to Tahiti. 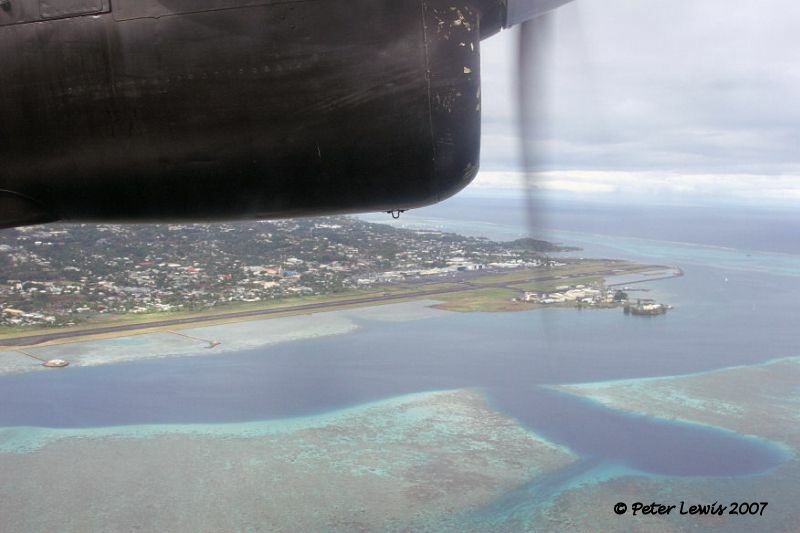 At that time, the Tahitian capital of Papeete did not possess a land airport. 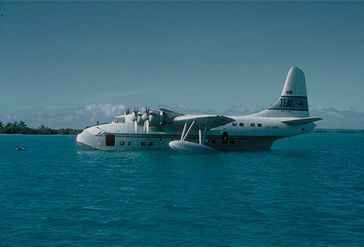 All land-based international flights to the city had to land at the ex-US base at Bora Bora and then transfer by Catalina flying boats to travel to the city. The airport at Bora Bora. 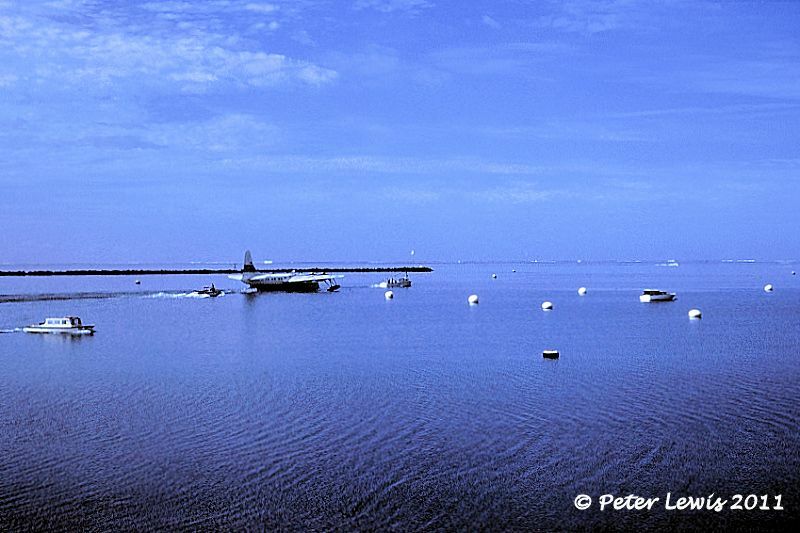 Even today, to leave the airport without travelling by air you must take the boat! 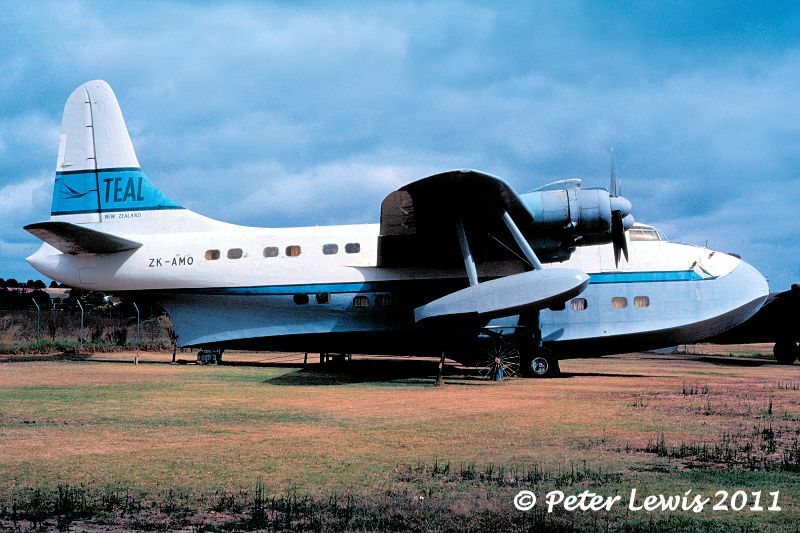 Thus to prepare for the proposed service, TEAL employed the Boeing PB2B-1 Catalina ZK-AMP as a survey aircraft. The route was devloped over time, and became famous as The Coral Route. Travel times were long: Auckland - (7.30hrs) - Suva, Fiji - (3.45hrs) - Apia, Samoa - (5.00hrs) - Aitutaki, Cook Islands - (4.05hrs) - Papeete,Tahiti. 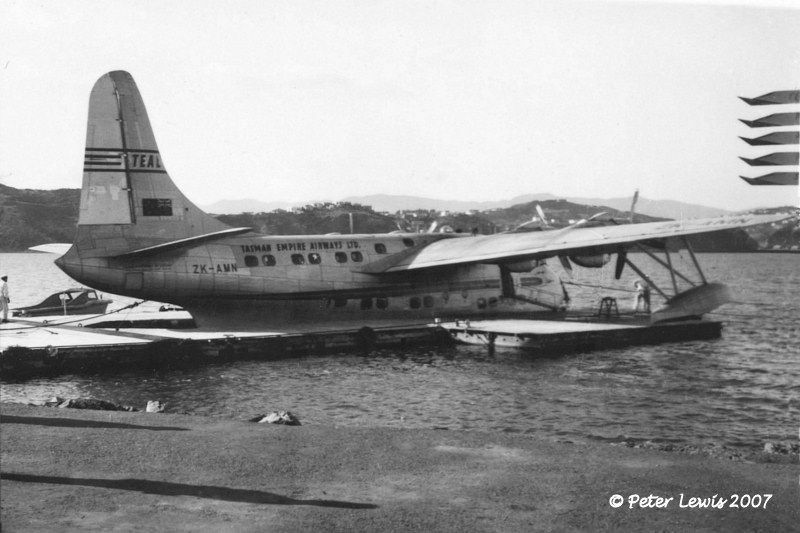 Over night stops were at Suva and Apia, then the flight left Samoa well before daylight to arrive in Aitutaki in the Cook Islands early in the morning. 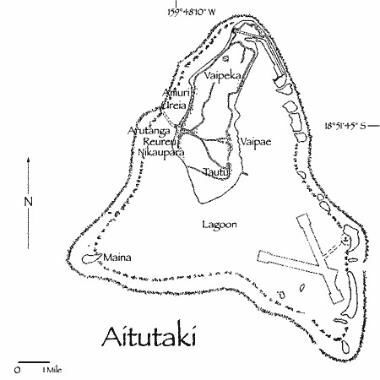 Aitutaki was intended just as a refuelling stop, and the passengers would leave the aircraft for just a few hours before reboarding for Tahiti. 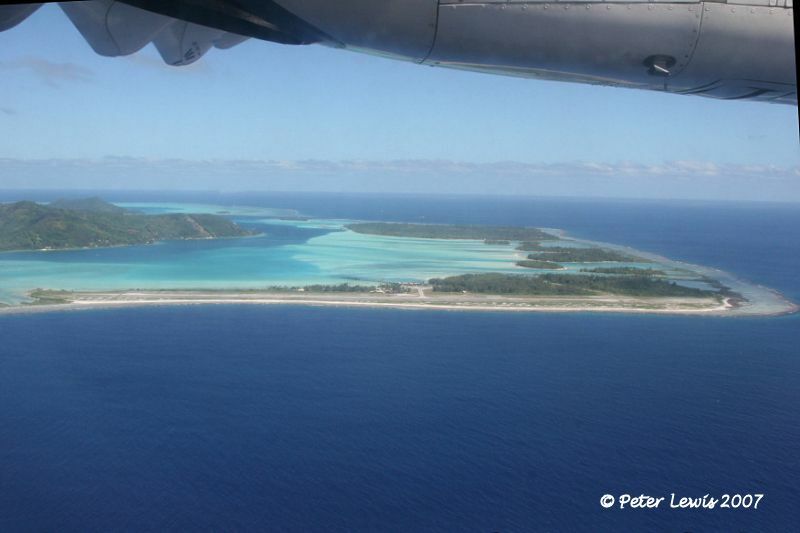 Aitutaki is around 40 minutes flying time from Rarotonga, and already possessed a sizeable wartime airfield. 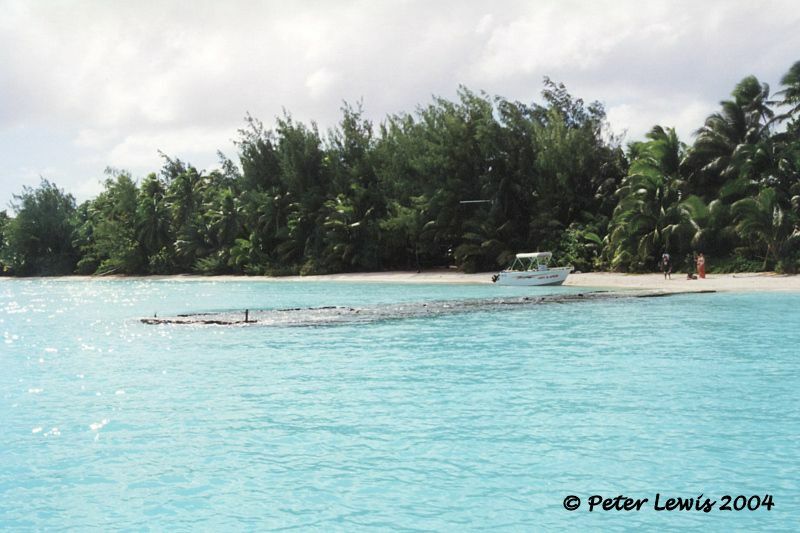 The logisics of the service meant that all fuel and food had to be shipped to Rarotonga, on to Aitutaki and then out over the lagoon to the islet Motu Akaiami which at that time was uninhabited. 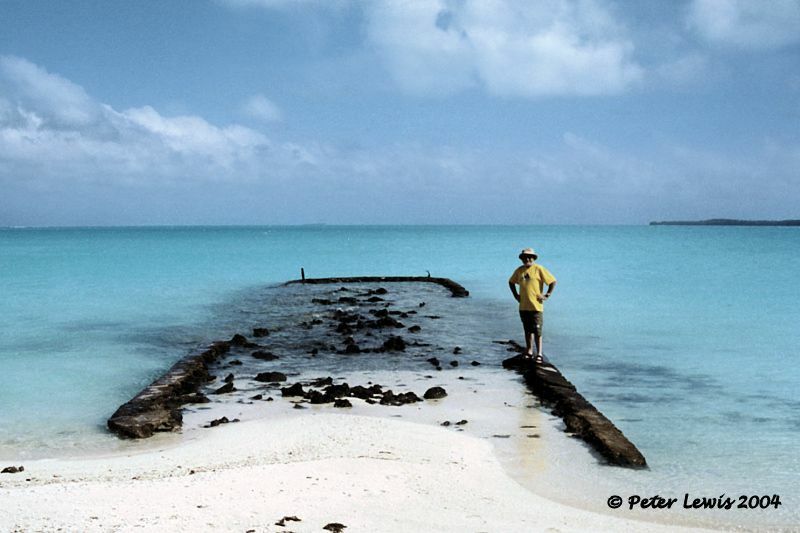 A stone jetty was built on Motu Akaiami so that passengers and supplies could be transferred out to the Solent, and a small building constructed to give the passengers shelter. 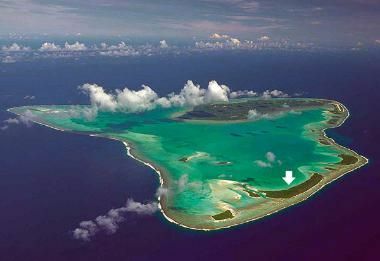 Aerial view of Aitutaki, the airfield is located at the top right of the island and the flying boat area arrowed. 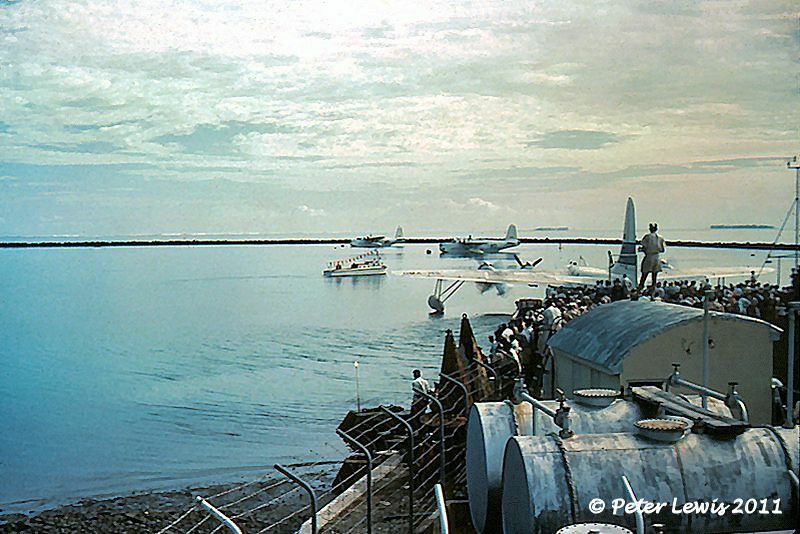 After the Catalina had set up the route, Solent III ZK-AMQ captained by J.R. McGrane and P.F. 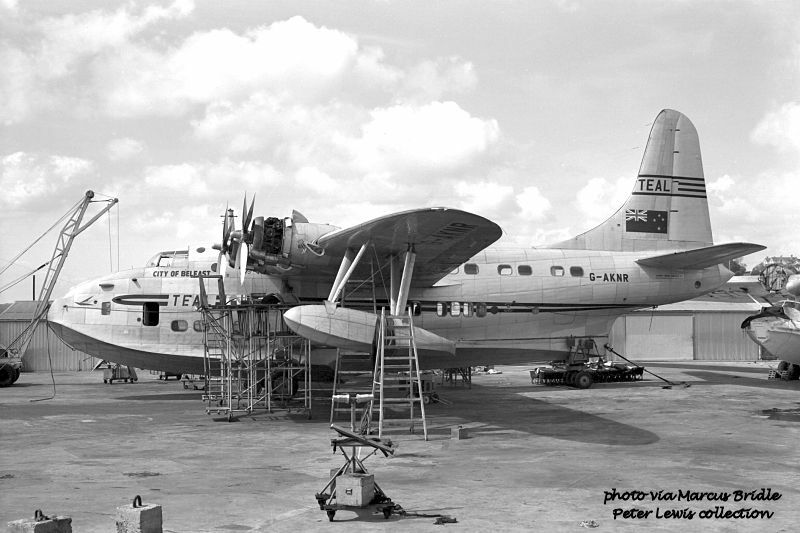 Le Couteur left Auckland on 28Nov1951 for Tahiti via Suva-Aitutaki on a proving flight. It returned to Auckland on 8 December. 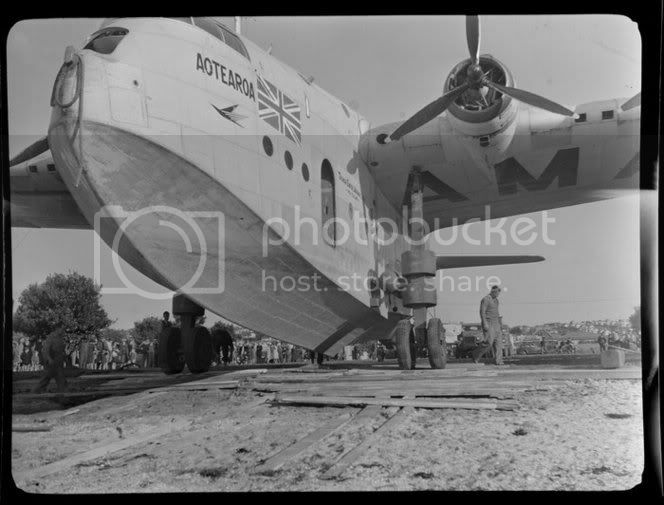 Following this flight, ZK-AMQ "Aparima" (Captain J.R. McGrane) carried out the first commercial service on the Coral Route departing Auckland on the 27th December. 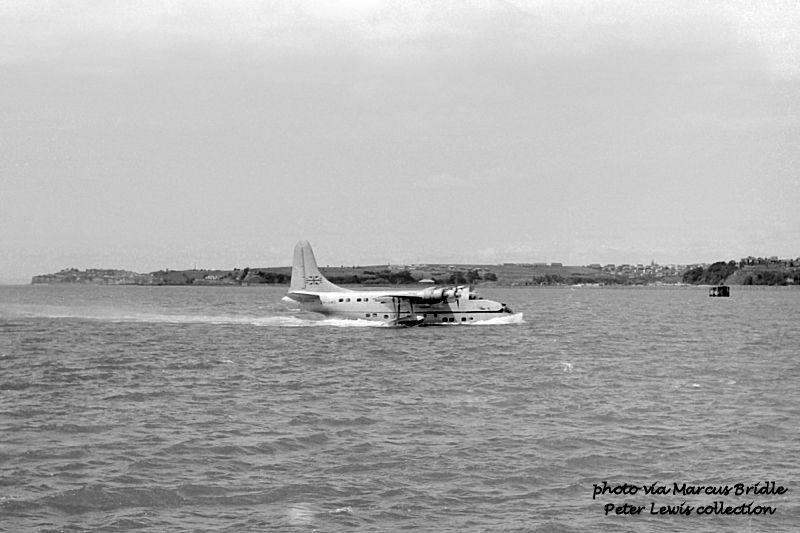 The return service commenced on 31 December and returned to Auckland on 4 January, 1952. 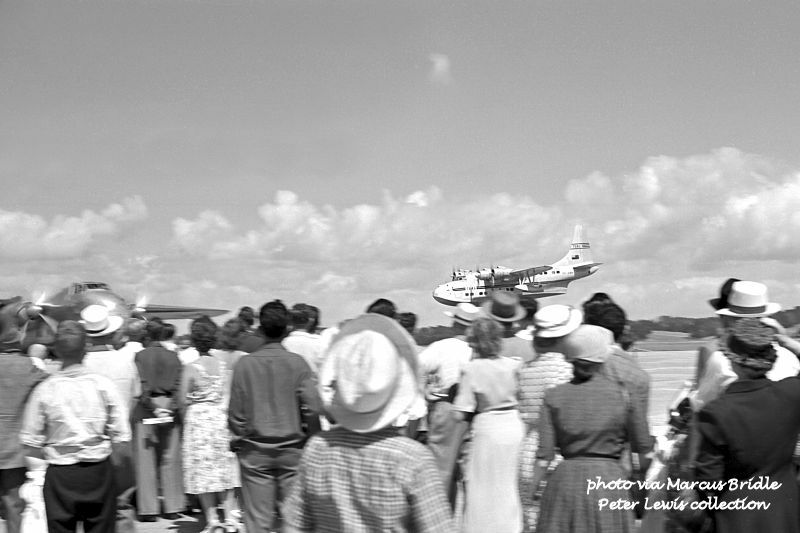 Initially the service operated on a monthly basis, but by May 1952 had increased to once every two weeks. 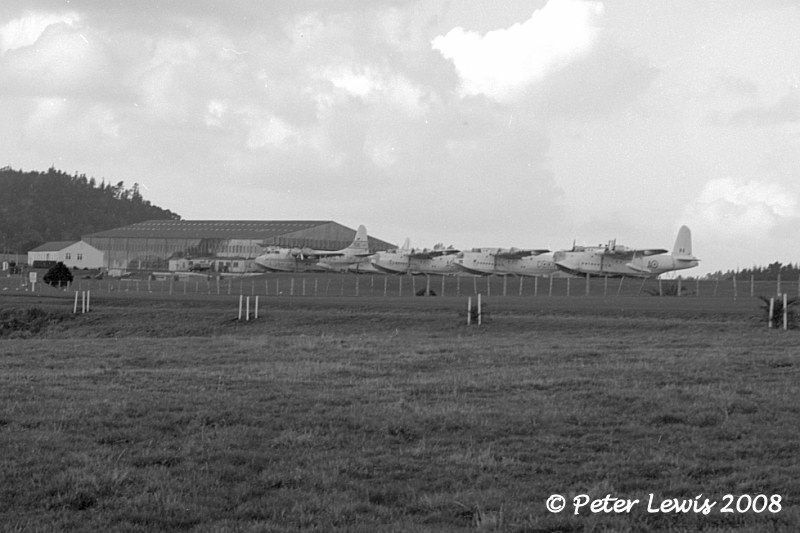 By 1954 the Solents were being replaced on most TEAL services by land-based aircraft. 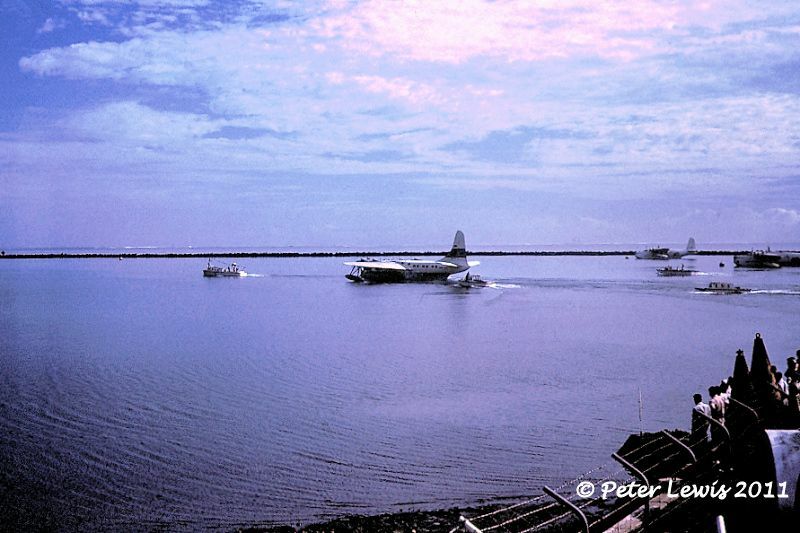 However, the Coral Route was maintained by ZK-AMO with Solent 3 ZK-AMQ initialy used as a reserve aircraft. Later on, Australian Sandringhams were hired to cover for maintenance. The end finally came in 1960, the service having become quite uneconomic. 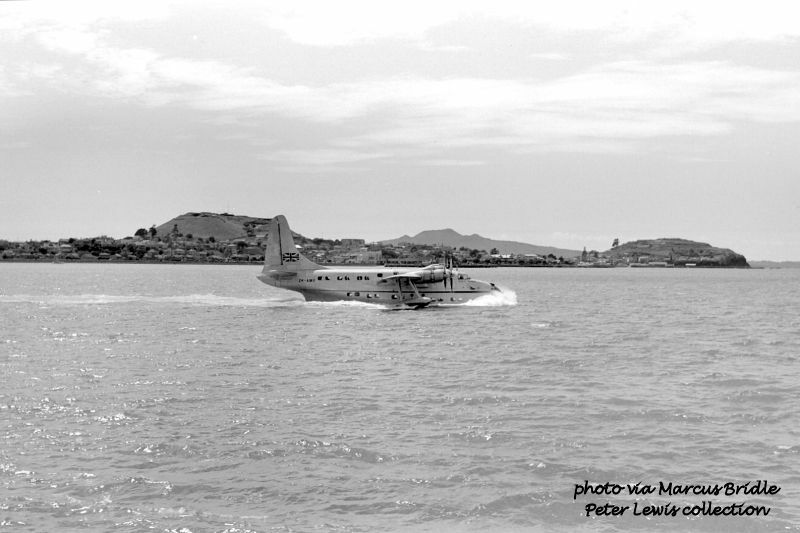 ZK-AMO departing Lauthala Bay, Fiji, on the final service back to Auckland 14Sep1960, Captain J Shephard. 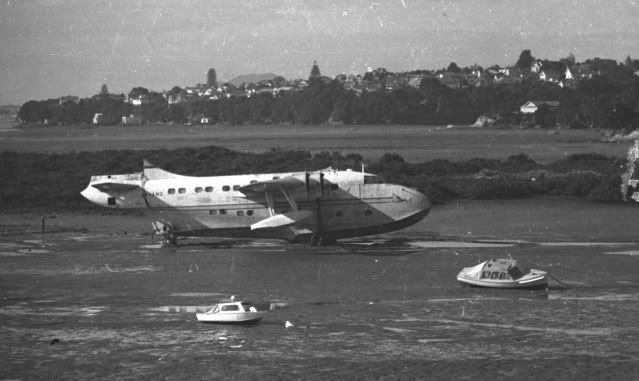 Once back in Auckland, ZK-AMO was decommissioned and taken into storage at Hobsonville. I do not know who was responsible for the decision to retain the aircraft as a museum piece, but that was certainly a far-sighted move. 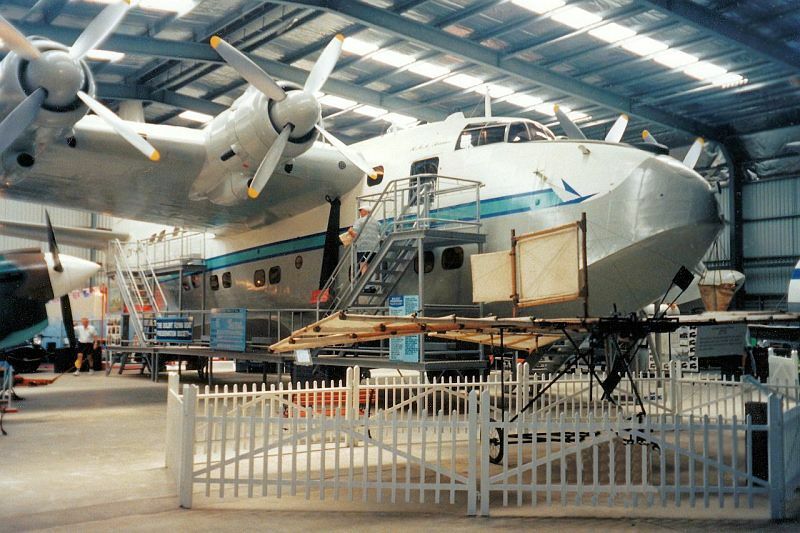 The Museum of Transport and Technology was still in the formative stages at that time, but the aircraft was held at Hobsonville until they were ready to accept it. 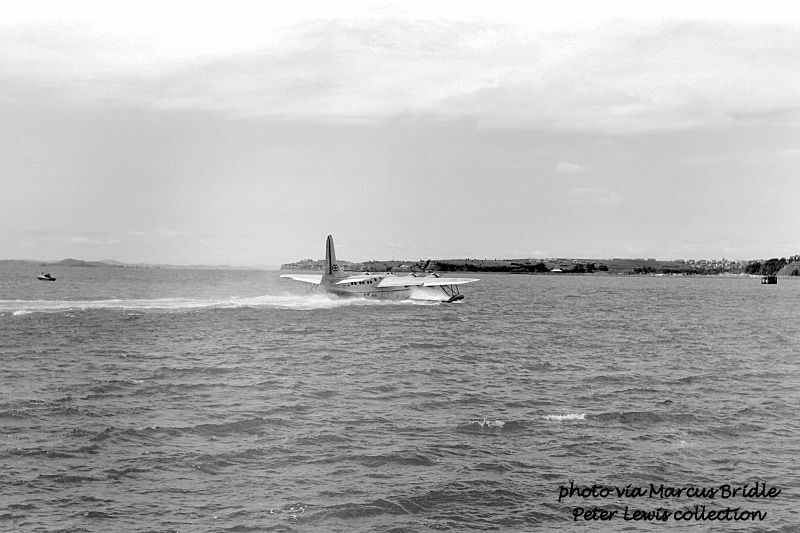 Finally, in May 1966, the Solent was returned to the water and towed down the harbour to be dragged back up on land at the new Meola Road site for MoTAT. 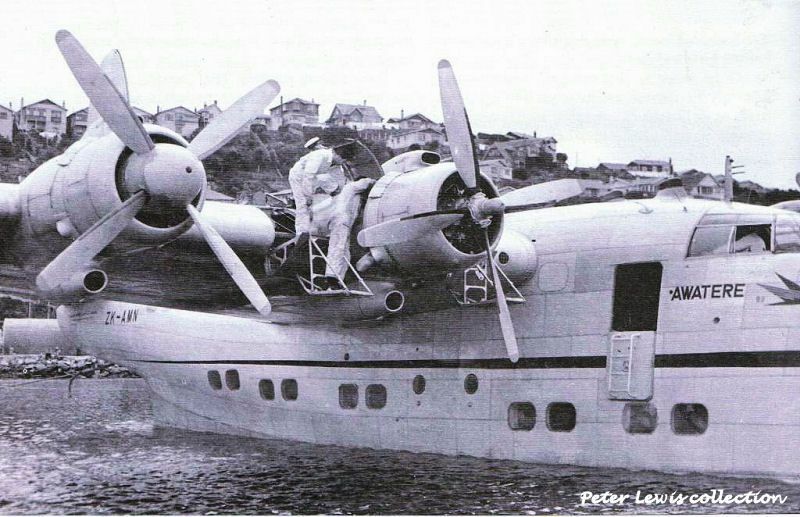 The engines and rudder were removed for this shift. Reassembled at the MoTAT site, ZK-AMO appeared in sound condition in the late 1960s. However, 23 years of exposure to the elements took there toll, and serious work had to wait until a new hangar was built and ZK-AMO was finally moved inside in 1989. At this time, external and inernal remedial work took place over many years, and when completed the Solent presented an impressive sight. Access stairs allowed for viewing of the interior. 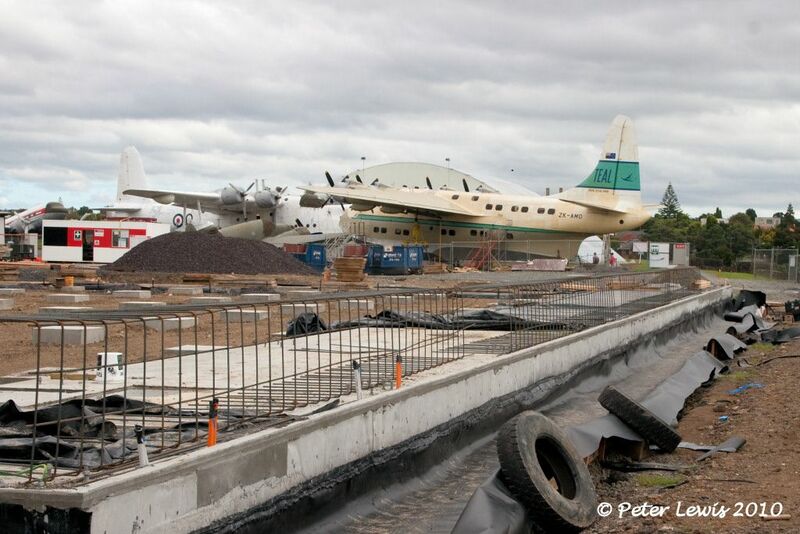 Now that the new building has been completed in late 2011, both ZK-AMO and the Sunderland NZ4115 will in time be able to be protected from the elements and preserved for all to admire. flyernzl Thanks for posting all these great photos...evocative. Fascinating also recalling the dress standards of the average Kiwi in those days with the low pass shot. 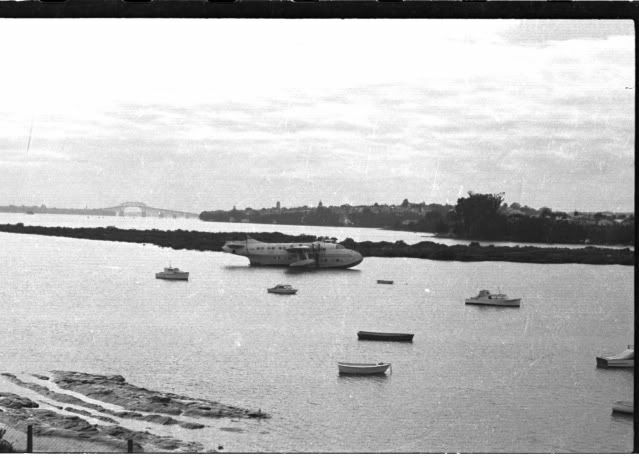 Great photos Peter but can you confirm when it was shifted to Motat as elswhere on the forum I saw photos that indicated Oct 1967 and here you have May 1966. I don't suppose you know when the Sunderland was moved to Motat as well. 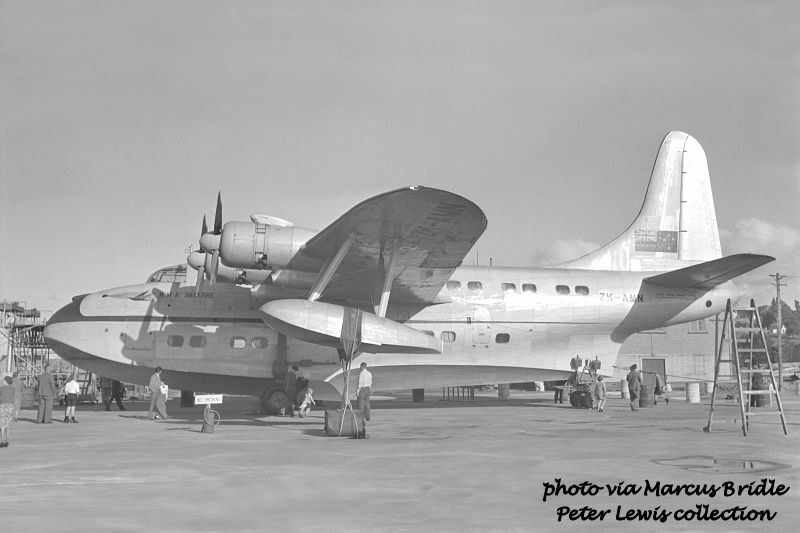 I am building up a collection of Motat aircraft photos and this series here completes its story. It is just for personal info. I would think May 66 but cant confirm it until I can access my photos again (currently in Dunedin) By 1967 I had joined the Air Force. 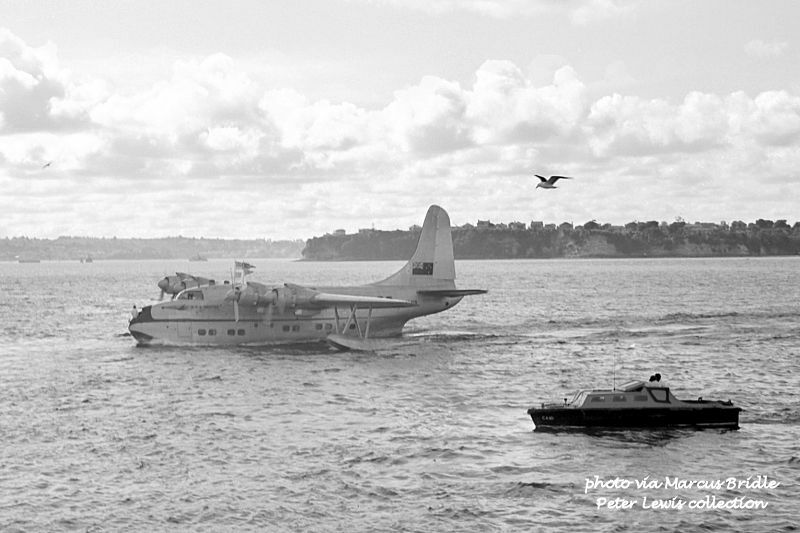 I have photos taken of the Sunderland arriving and my girlfriend of the time appears in some of them lookiing at the Sunderland arriving from on top of the Solent. Thinking of when i was going with her I think we split up in late 67 and as we were on the Solent it must have arrived earlier than that. My notes for ZK-AMO definitely state May 1966. Date of delivery for NZ4115 was 25Feb67. Have now redated photos and deleted some as they were the same. Just have to work out now how to get them in the correct order sequence. Any idea? I use photoshop elements. Not quite sure what you mean by sequencing. That preserves the naming while allowing a sort to establish the correct order. By stepping the numbers in 10s, if you want to move a photo or two within the sequence at a later time you can do so without having to change all of the other numbers. 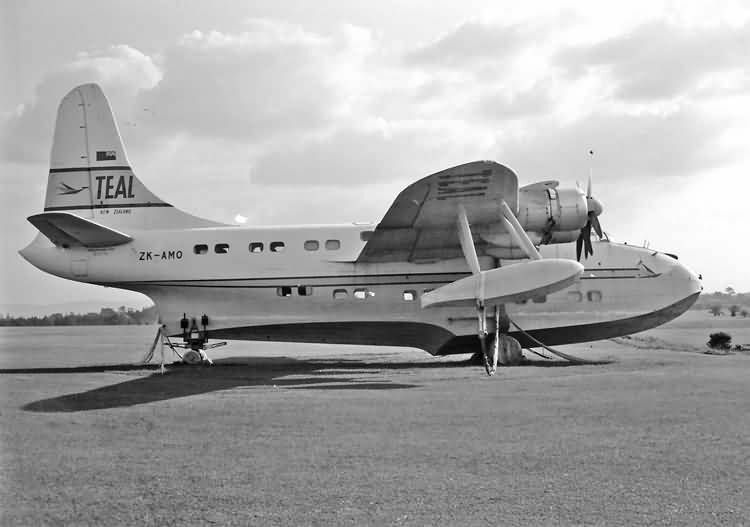 With the operational efficiency and reliability of the Solent 4s and the establishment of new routes, demand for airline seats increased and TEAL found themselves running out of capacity. 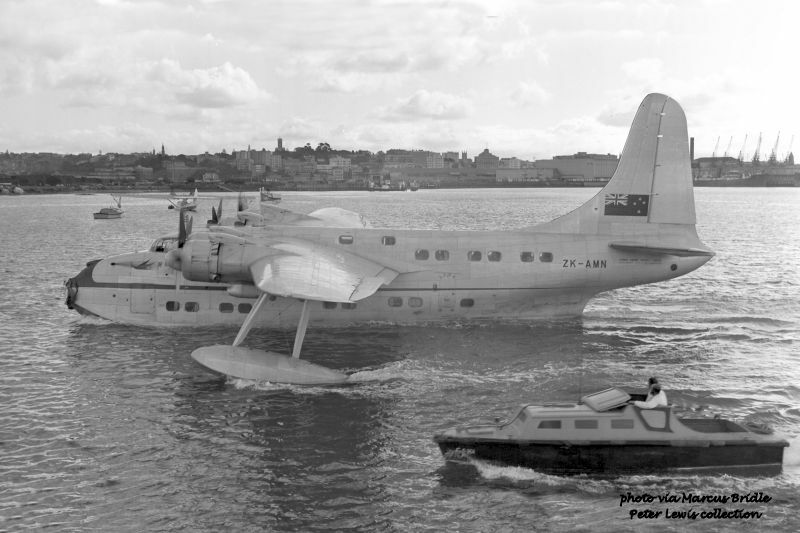 They needed another Solent, but Shorts had ceased to build this type of aircraft. Therefore TEAL had to cast around the second-hand market and, of course, only the earlier versions of the Solent were available. 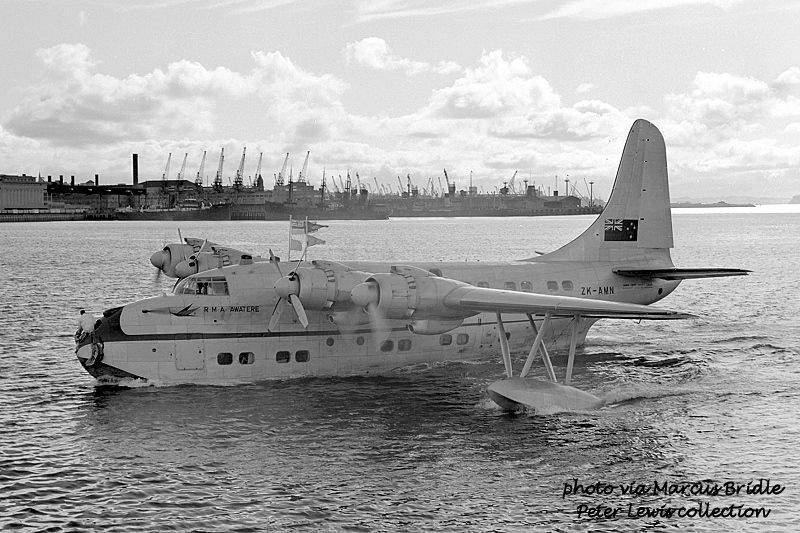 Eventually, they were able to obtain a Solent from the British Overseas Airways Corporation. This was G-AKNR, c/n S.1296 which had originally been constructed at Rochester as a Short Seaford 1 with the military serial NJ204 in 1946. 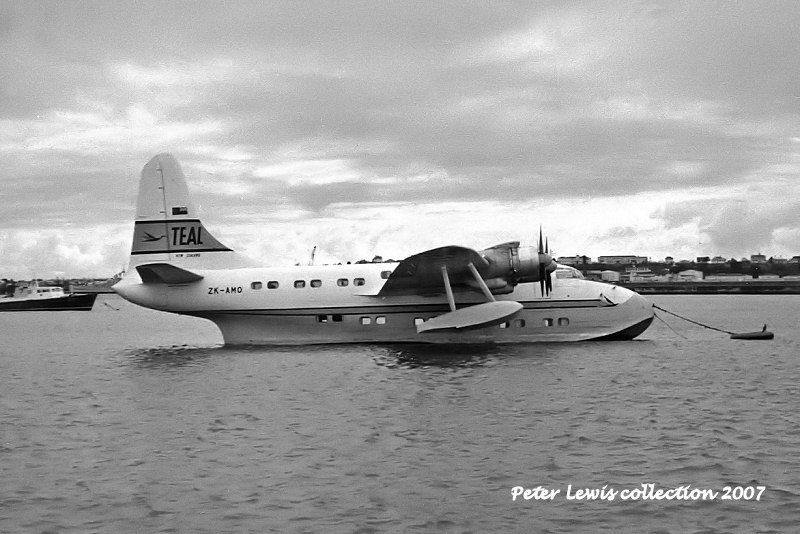 It was converted to a Solent 3 at Belfast and was registered as G-AKNR to the Ministry of Civil Aviation 27Apr1949. 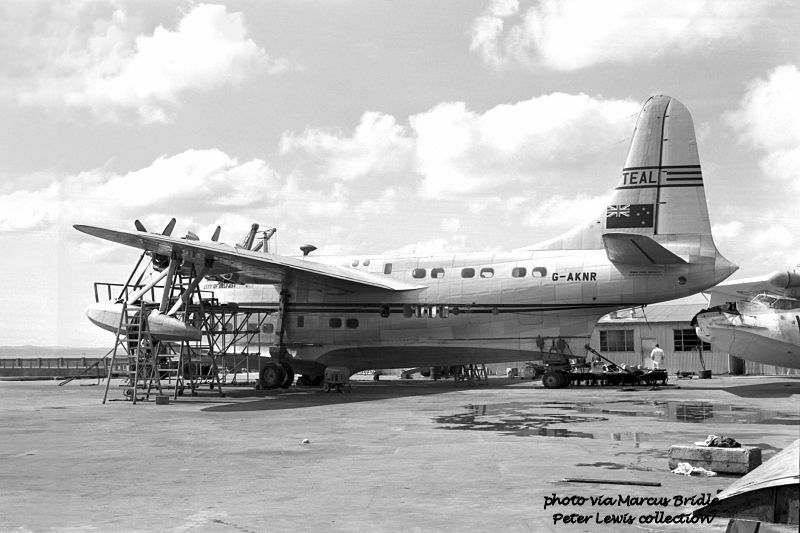 During its service with BOAC it carried the name 'City of Belfast'. 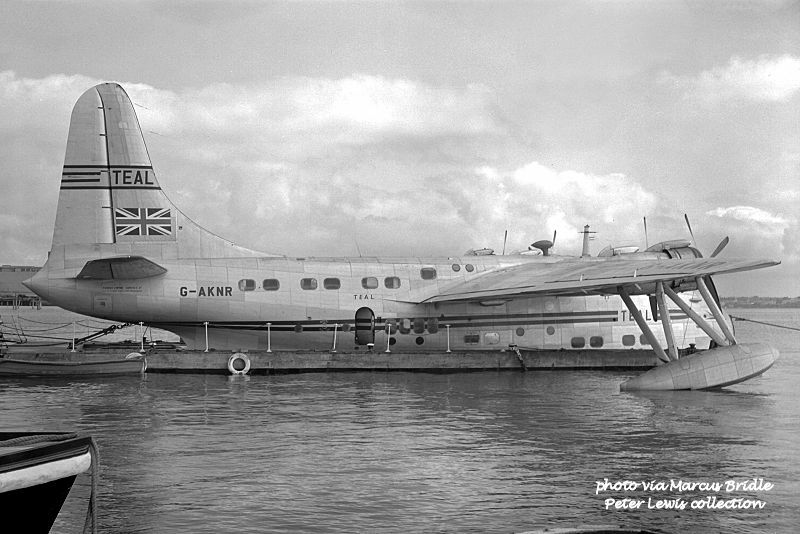 G-AKNR arrived at TEAL's Mechanics Bay base 15Sep1951 and apparently at that time carried full TEAL colours but still bore the British registration and the 'City of Belfast' name. 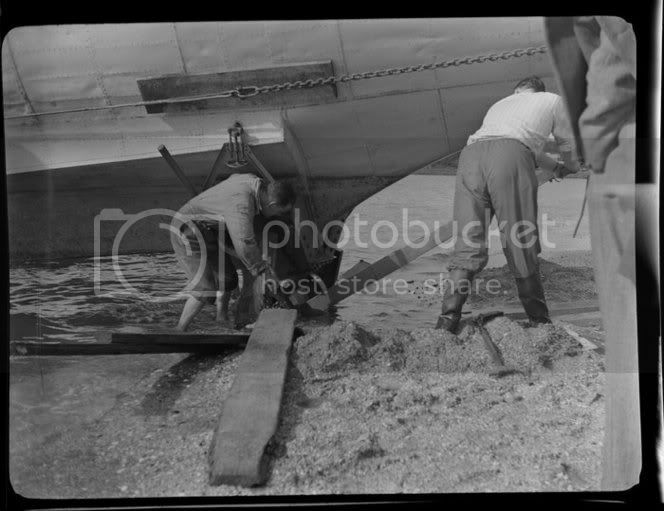 It would appear that these photos were taken at Mechanics Bay soon after that arrival and before the Solent becam ZK-AMQ 'Aparima' on 8Nov1951. 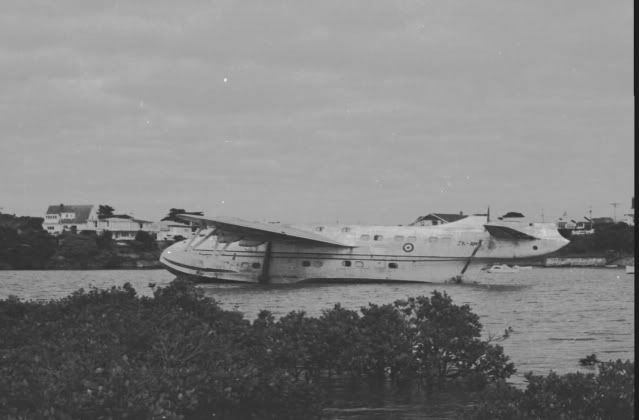 ZK-AMQ, being of lower power that the other Solents in the fleet, appears to have been used largely as a reserve aircraft and also pioneered the Coral Route flights. 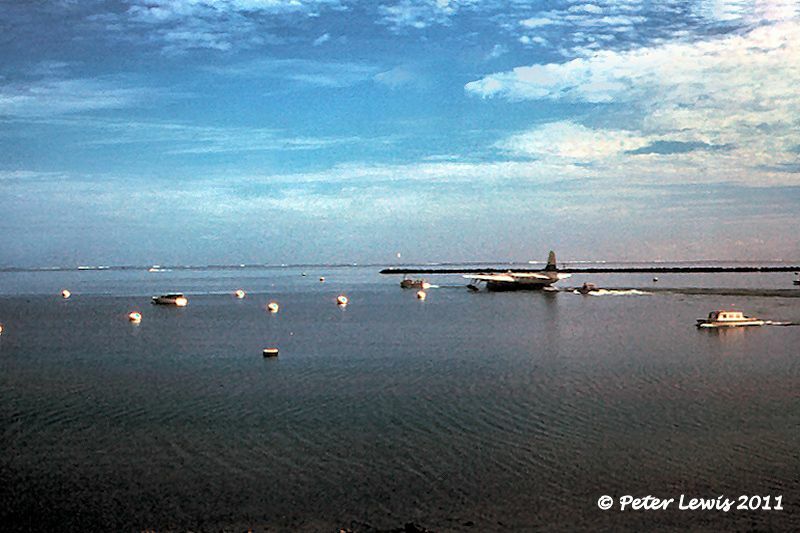 After the Catalina ZK-AMP had set up the route, Solent III ZK-AMQ captained by J.R. McGrane and P.F. 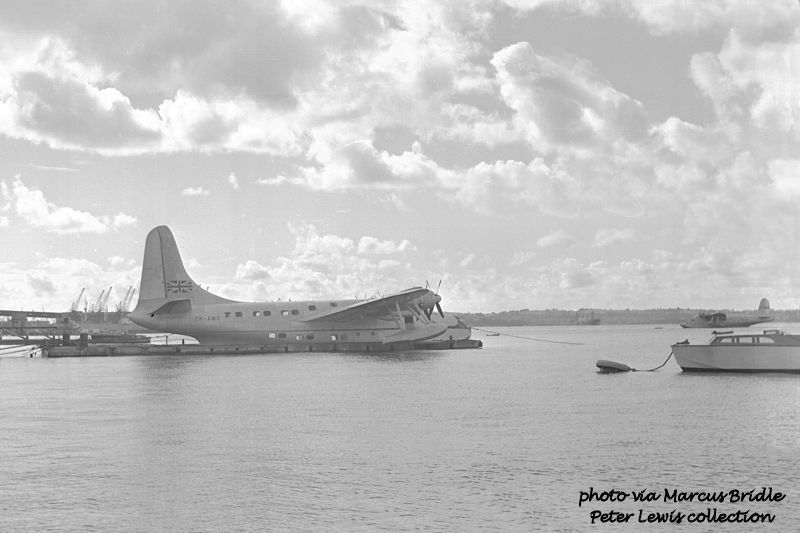 Le Couteur left Auckland on 28Nov1951 for Tahiti via Suva-Aitutaki on a proving flight. It returned to Auckland on 8 December. 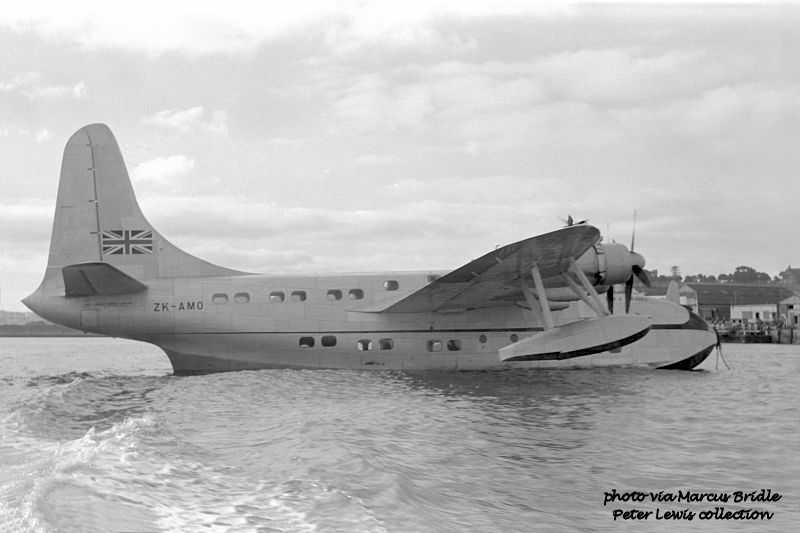 Following this flight, ZK-AMQ "Aparima" (Captain J.R. McGrane) carried out the first commercial service on the Coral Route departing Auckland on the 27th December. 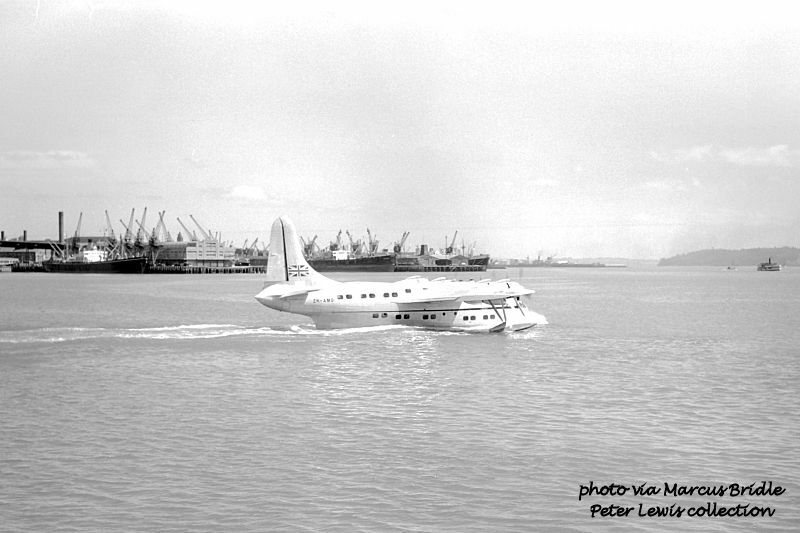 The return service commenced on 31 December and returned to Auckland on 4 January, 1952. 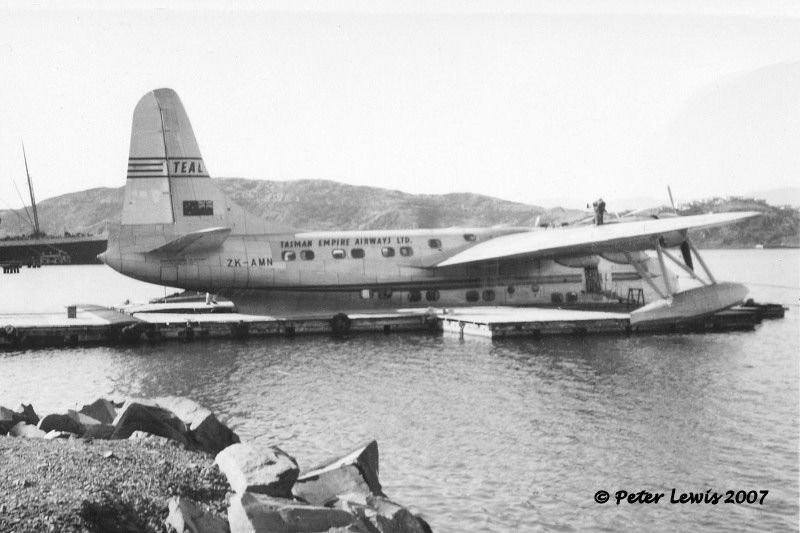 After the demise of ZK-AMM and the sale of ZK-AML and ZK-AMN, ZK-AMQ was withdrawn from scheduled service on 19Jun1954 and kept in reserve as a backup for ZK-AMO which was operating the Coral Route. 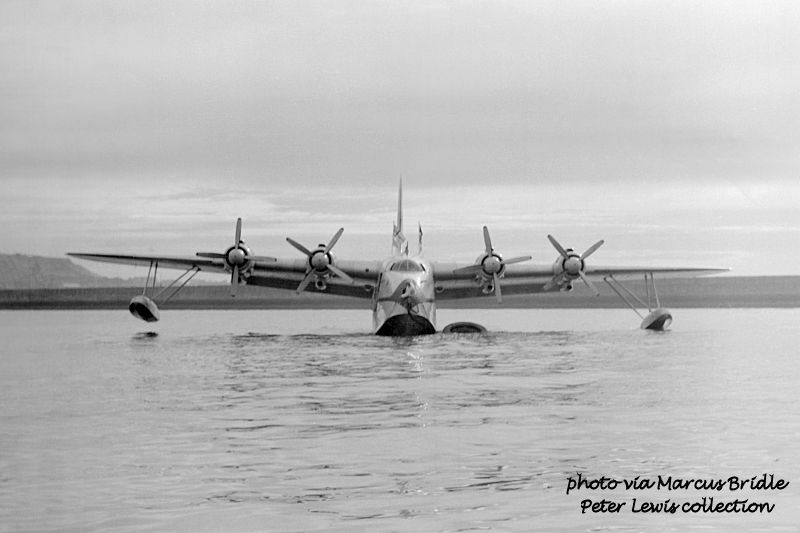 This aircraft was needed in 1955, when ZK-AMO had to be removed from service in March for main spar modification work. 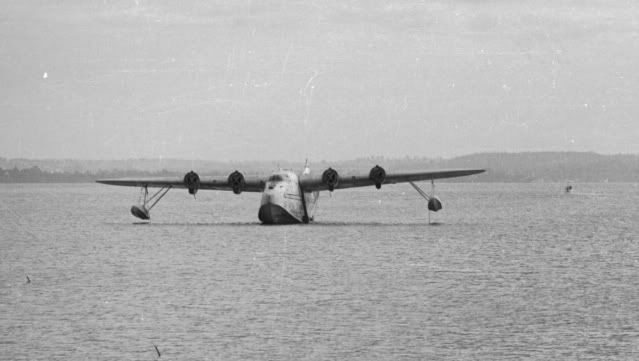 ZK-AMQ was removed from storage on 9Mar1955 and carried out a test and training flight at Auckland the following day. 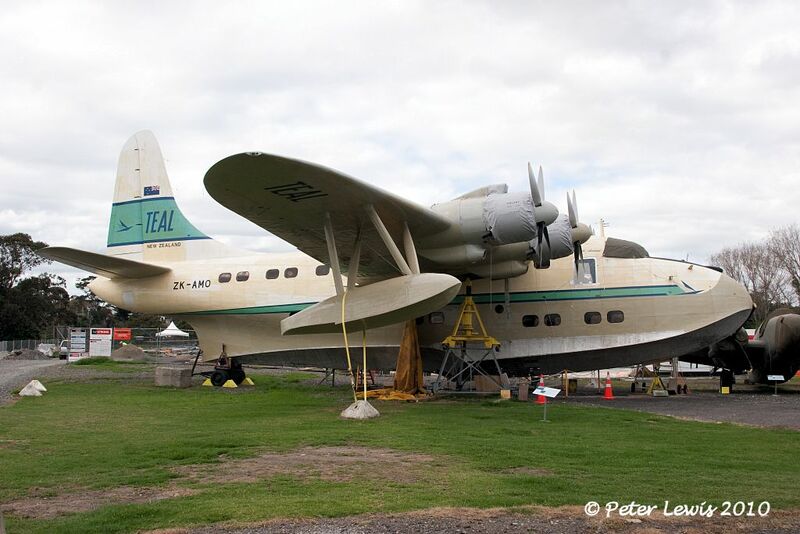 on the 15th it was flown to Fiji to operate the Coral Route from the 15th March to the 20th May. 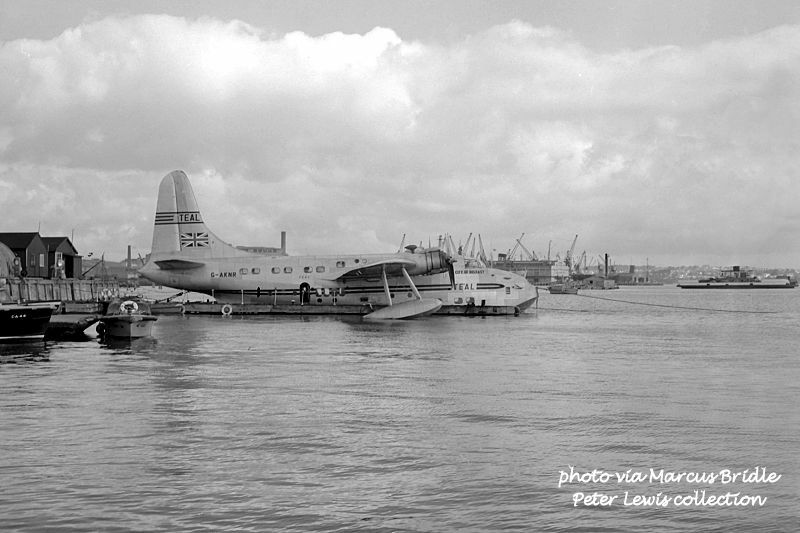 It was then returned to Auckland when ZK-AMO re-entered service, and was again placed in storage from 22May1955. 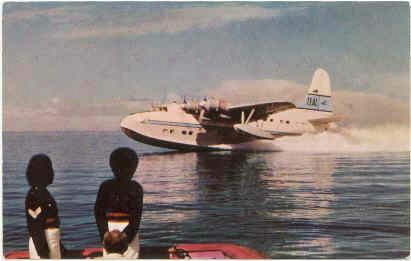 In 1956 runway problems at Nandi (Fiji) necessitated the TEAL Auckland-Fiji sector to revert to flyng boat utilization. ZK-AMO was used on this service from the beginning of August until early October. Therefore ZK-AMQ was again called back into use, carrying out test flights at Auckland on the 23rd July and 1st August before flying to Suva on the 3rd. 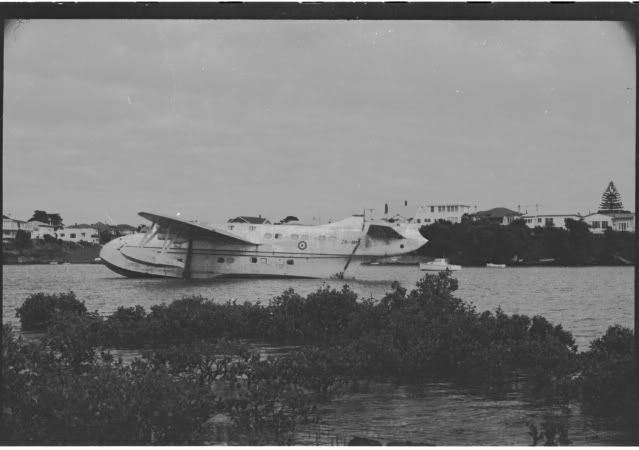 It then operated the Coral Route from 6Aug1956 until 12Oct56 when ZK-AMO was again available. 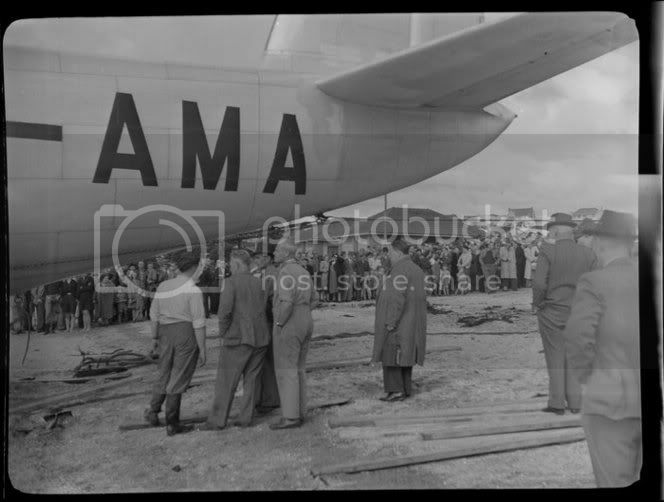 ZK-AMQ flew back to Auckland on the 17th, and then operated the final TEAL Auckland-Chatham Islands-Auckland flight on 19/20Oct1956. 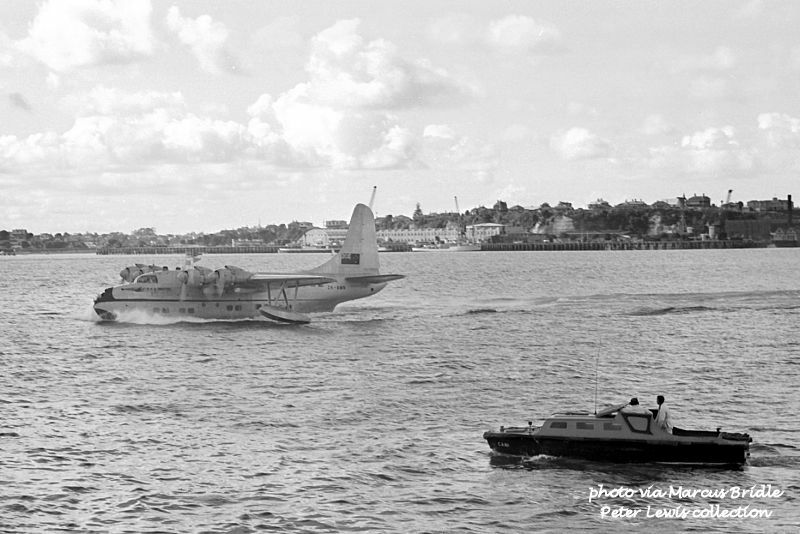 This was ZK-AMQs final flight, and the Solent was again placed in reserve storage. 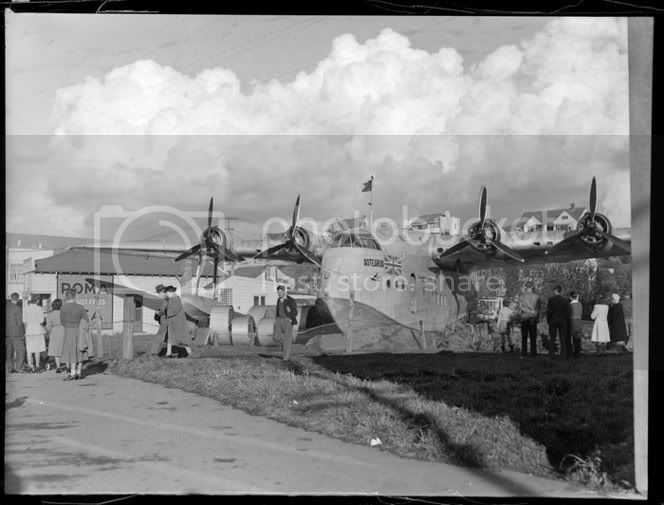 By mid-1957 it was stripped of useful equipment, and was sold for scrap on October 1957. I have been doing some research into the final resting location of ZK-AMA at Mission Bay. after being dragged up from the water, you can see the side wall of the dairy (Mrs Green's) with the Roma Tea advertising. This is the same Roma Tea wall visible in other photos when it is finally parked. So it finally rested directly behind where it was turned on Tamaki Dr. These other photos indicate it is on the block of land next to the dairy, with the dairy being on the corner of Tamaki Dr and Patteson St. 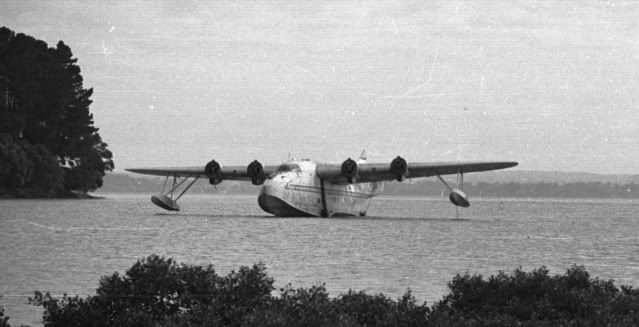 In the process I came across some additional photos from the White's Aviation collection, of the drag from the water and perched on its mound of soil. This one, on the mound, shows the dairy wall quite clearly, and close.